Movie Review : "Alvin and The Chipmunks 3: Chipwrecked"
The "Alvin and the Chipmunks" movie franchise had been very successful in the box office but is not well-received by the critics. "Alvin and the Chipmunks 3: Chipwrecked" does nothing new to elevate the material and continues to deliver more of the same. The Chipmunks and The Chipettes (three female counterparts to the Chipmunks) go on a cruise vacation trip with the Chipmunks' owner/manager/father figure, Dave Seville (Jason Lee) aboard the Carnival Dream cruise ship. During the cruise, the Chipmunks and Chipettes turn the ship into their personal playground, causing trouble and running amuck as they will. Eventually, their chaotic behavior gets them ship wrecked on a desert island, everyone getting lost in the process. As Dave sets out to look for the lost chipmunk trios, the six find a new castaway named Zoe (Jenny Slate) on the island who turns out to be more than a match for the trios. But it was a formula that was supported in droves by the audience, so people who enjoyed the first two movies will like this one and while giving those didn't like it no reason to give this franchise another look. The story, based on the characters created by Ross Bagdasarian and Janice Karman, is wafer-thin. The screenplay (by Jonathan Aibel and Glenn Berger), and the dialogues salvage the film to an extent and make it worth watching, especially for the kids, who may enjoy the antics of the chipmunks. The dialogues are witty and reflect emotions which the kids in the audience will relate to. But there’s little in the film for the grown-ups. Although this is probably to entertain the parents who have been dragged to watch this film, I think it would be better to warn them that there is a older content weaved into this furry, family film. But on the “cute” aspect, Chipwrecked certainly delivered from the showstopping numbers of Katy Perry and Lady GaGa hits to the various shenanigans in the cruise ship and the island. Regardless of your overall view of the movies, only those with a heart of stone will not fall for Theodore's cuteness. The went on an adventure while they perform pop songs from time to time. It goes the same to the Chippettes who all basically mirrors the personalities of their male counterparts. The movie did somehow shake things up with Alvin learning about responsibility and Simon loosening up. But in the end, the story does not offer that much excitement or insight despite the premise as the movie just coasts along until we reach the conclusion. Jason Lee and David Cross are good actors and while they are still not used to their fullest potential, they do deliver good enough performances as opposed to Jenny Slate who played Zoe terribly. David Cross is fine as Ian, while Jenny Slate does an average job as the girl who meets the chipmunks on the island. 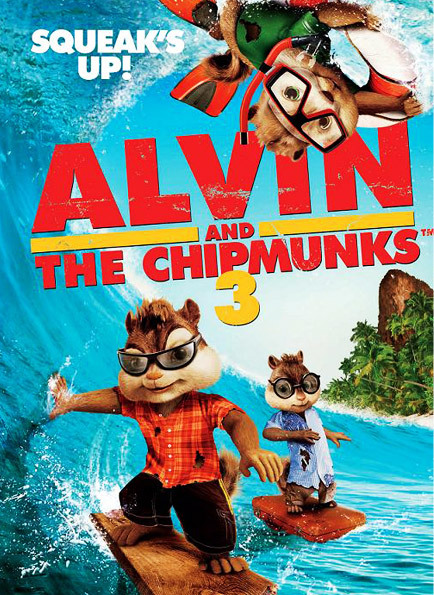 "Alvin and The Chipmunks 3: Chipwrecked" is basically just fluff but it's all pretty harmless. If you loved the first two, you will surely love this 3rd installation. With the cinema nearly packed out with a mixture of children and adults, I knew this film was going to be a big hit with the younger generation. Giggles, gasps and sighs were to be heard throughout the cinema. In my opinion this film was better than the ‘Squeakquel’ which followed the first film. ‘Chipwrecked’ has more of a storyline although it nicks ideas from Tom Hanks’ "Cast Away."